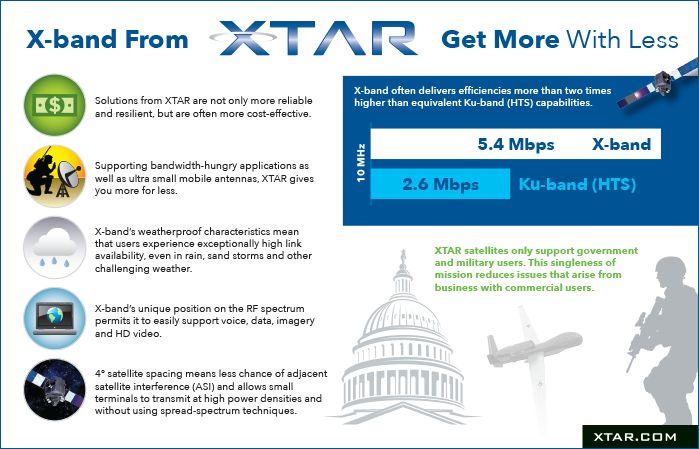 On land, in the air or at sea, XTAR’s space segment is the optimal choice for today’s government and military user. The characteristics of X-band make it ideally suited for mobile applications where the smallest of terminals are used. Airborne missions, small teams deployed with manpacks, and operations at sea all demand exceptionally high levels of throughput and availability (99.9%) in both transmit and receive mode. Why use X-band?